Accessible text version of NPS MedicineWise grading system for diagnosis of neuropathic pain. A patient presents with pain. The patient history is taken. If it is suggestive of a relevant neurological lesion or disease AND the pain distribution is neuroanatomically plausible, a ‘possible’ diagnosis of neuropathic pain is reached. If not, the pain is unlikely to be neuropathic. If the pain is associated with sensory signs in the same neuroanatomically plausible distribution, a ‘probable’ diagnosis of neuropathic pain is reached. When a probable diagnosis for neuropathic pain is reached, the diagnosis and treatment should be discussed. Treatment should only be initiated at this point. Consider further investigations only if diagnosis remains uncertain, or to identify any treatable cause. A diagnostic test can confirm a neurological lesion/disease explaining the pain, resulting in a ‘definite’ diagnosis of neuropathic pain. 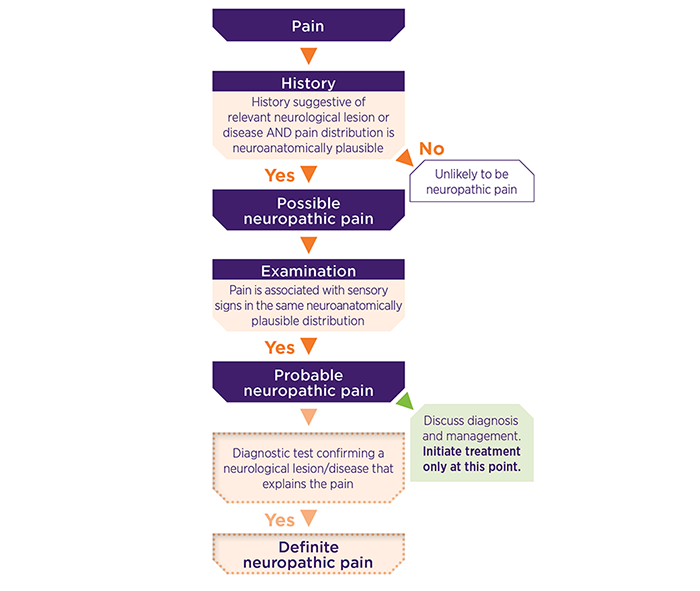 This process is summarised in the graphic version of Grading system for diagnosis of neuropathic pain.